I've had the Garminfone in my posession for a little more than 24 hours, and so far, I am quite impressed. Sure, the specs are lower than the flagship Androids popping up this summer, and that's evident when using the Garminfone's laggy virtual keyboard. But the hardware is elegant - even luxurious - and the navigation has me forgetting all about my love affair with Google Maps. More coverage on this device is in the works, and I'm plan on shooting at least a bit of road use tonight. Some office shots of navigation options are in the can. 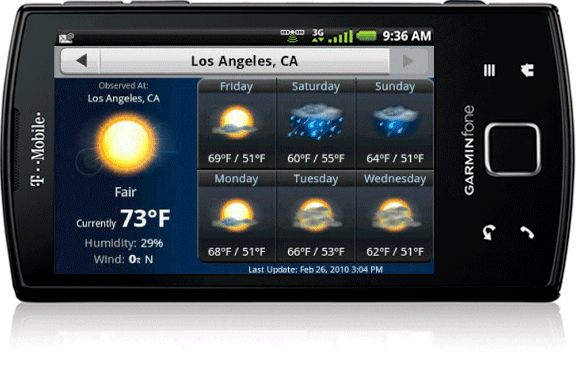 So stay tuned for more Garminfone this week. I'm taking questions and requests on this device, and you probably know the deal. But here's the standard spiel for newbies: Send me a question about the Garminfone or a request for something you want to see me demonstrate with it on video. I'll post at least one video response with me answering questions and fulfilling requests. To send me your question or request, @reply me on Twitter; that's PhoneDog_John. Please, please, please place this hashtag in your tweet: #Garminfone. You can also send me a text message at 503-MOB-BARK. That's 503-662-2275. Mention Garminfone in your message! That number is for SMS only; no one will be checking voice mails or answering the phone! Aight! ?